I had been looking for this species for a long time without success. 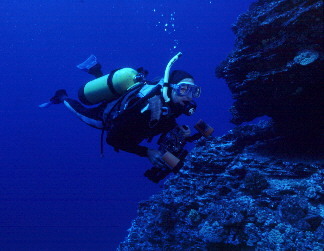 One summer night during a dive at Pupukea on the north shore of O`ahu, Ron Holcom pointed out several to me. 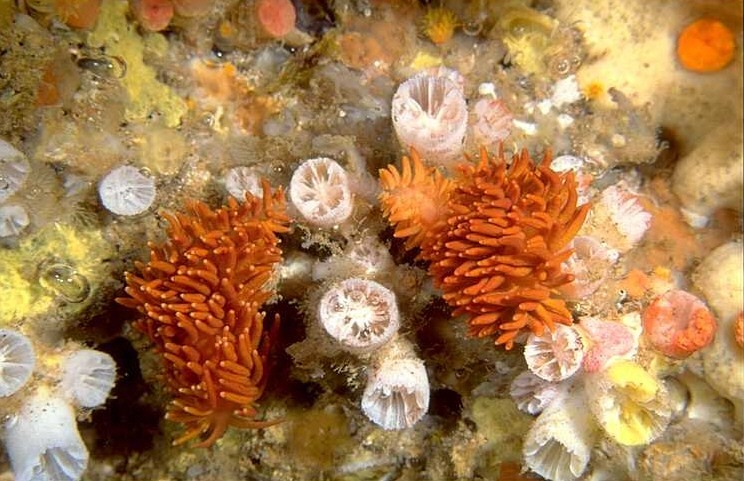 They were among orange cup corals on the roof of a cave. I was surprised at their size (I had expected them to be much smaller) and the intensity of their color, which exceeded that of the coral around them. These eolids feed on corals of the family Dendrophylliidae. In Hawai`i this is usually Tubastraea coccinea, which occurs under ledges and in caves, especially in areas with some current. Active only at night, the slugs match their prey in color and form and are difficult to see. One way to find them is to look for the white skeletons of recently eaten polyps. In Australia these animals also feed on a species of dark green cup coral. Experimentally moved from orange to dark coral, they change color in about a week. The first specimens collected were probably dark, hence the species name meaning "dark arms." The species attains about 1 1/2 inch and has an Indo-Pacific distribution. Photo: Pupukea, O`ahu. 20 ft. The similar Phestilla lugubris feeds on corals of the genus Porites. Like this species, it is superbly camouflaged. Although rarely noticed in the field, it is easy to culture and has been the subject of considerable research at the University of Hawai`i.